Stock photo of a unique angle of the Saamis Tee pee, the world's largest tee pee, in the city of Medicine Hat, Alberta, Canada. Standing inside and looking up at the Saamis Tee pee is a unique perspective of the design. 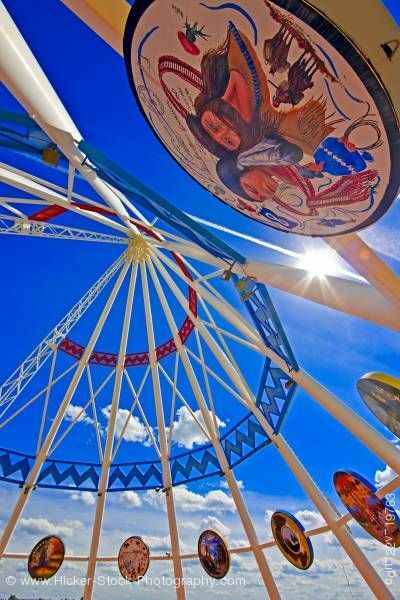 This stock photo shows the Saamis Tee pee, the world's largest tee pee, in the city of Medicine Hat, Alberta, Canada. Standing inside and looking up at the Saamis Tee pee is a unique perspective of the design. Long white poles are set in an a-frame and attached at the top. A red zigzag border encircles a few feet below the top. Below the red border are smaller white poles that cross between each long white pole; next are a row of zigzag border in blue. A few feet below the blue border are round brightly colored paintings of different scenes of Native American culture. Because of the angle, one of the paintings can be seen close up. The sun rays are bright between two white poles with a beautiful blue sky and white clouds for the backdrop. Saamis Teepee, the world's largest teepee, in the city of Medicine Hat, Alberta, Canada.